The TUC has warned companies that there will be "no hiding place" if they exploit their workers. 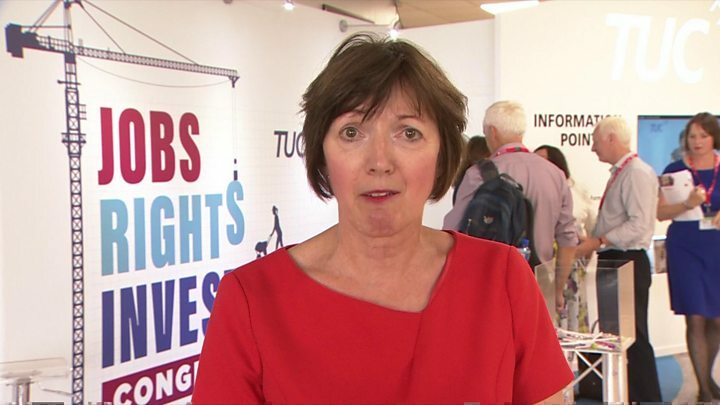 General secretary Frances O'Grady told delegates at its annual conference in Brighton that mistreatment is becoming more widespread in the UK. She warned "greedy" businesses that her organisation would "shine a light on you". This comes amid a renewed focus by trade unions on improving conditions for workers. The TUC said the type of working practices "typified" by Sports Direct, which has been under fire for the treatment of its staff, was becoming more widespread. "Sports Direct may be in the spotlight now, but they are not the only ones. There are other big companies that bring shame on our country. So let me give fair warning to any greedy business that treats its workers like animals - we will shine a light on you," Ms O'Grady told delegates. "Run a big brand with a dirty little secret? A warehouse of people paid less than the minimum wage? A fleet of couriers who are slaves to an app? Let me put you on notice. There will be no hiding place. We will organise and we will win," she said. Sports Direct's decision to end zero hours contracts in stores and put some agency workers on permanent contracts was a spectacular win for the trade union movement. But unions know that the number of people on zero hours contracts is rising and self-employment continues to grow. So, they are responding to this growing casualisation of the workforce - both to help those that are being exploited but also to sign up young people who are under-represented in trade unions. Unions have also launched legal action against businesses like courier and taxi firms which have thousands of self-employed drivers who are not classified as workers and who don't enjoy basic workers rights. Last week, Sports Direct promised to improve conditions after the sportswear chain's lawyers produced a critical report of how some staff were treated. MPs had previously said working practices at the Shirebrook warehouse in Derbyshire were closer to "that of a Victorian workhouse than that of a modern High Street retailer". Ms O'Grady said the firm's promise to abolish zero-hours contracts for its directly employed, casual retail staff - and to make sure all staff were paid above the national minimum wage - was down to "trade union shareholder power". "Britain's unions will not rest until every worker gets the fair treatment they deserve," she said. The TUC general secretary earlier praised the actions of pub chain Wetherspoons which said it would now allow all staff on zero-hours contracts to move to ones that provided guaranteed minimum hours after trialling the idea in parts of the business. "The success of the Wetherspoons trial proves that businesses can be successful without zero-hours contracts," she said.